It was 1947 when Howard Hughes, the US visionary aviator and aircraft designer, used epoxies for the first time in the construction of his airlift flying boat “Spruce Goose”. Also known as HK-4 Hercules, this aircraft was designed during World War II to transport cargo and troops over long distances. Its massive size and distinctive wooden construction – assembled with three layers of epoxy glue – made it an American icon. Epoxies and aircraft design have been inseparable ever since. How did epoxies take off? The first modern use of epoxy resins in aircraft design dates back to about 40 years ago when boron-reinforced epoxy composite was used for the skins of the empennages of US fighter aircrafts F14 and F15. At first, epoxy-based composite materials were used only in secondary structures, but soon engineers realised that their use in primary structures, such as wings and fuselages, would improve the performance of the whole aircraft. In fact, while the F15 used around 2% of composite material, the F18 included 19% and the F22 a sizeable 24%. It did not take long for commercial aircrafts to follow the footsteps of trailblazing defence applications using epoxy-based composites. The main advantages: composite material reduces airframe weight, which enables better fuel economy, lower operating costs and lower CO2 emissions. European conglomerate Airbus saw this potential and, in the 1980s, started to apply composite materials in the rudder of some of its commercial aircrafts such as the A300 and A310. All these improvements in aircraft design led us to the current models, such as the workhorse Airbus aircraft, the A320, which features a tail structure made entirely of carbon-fibre reinforced composite material. In addition, its floor panels are made of glass-fibre reinforced epoxy polymer, lowering the total composite airframe weight by 28%. The iconic Airbus A380, the largest commercial passenger plane in the world, carries around 28% composite material by weight. 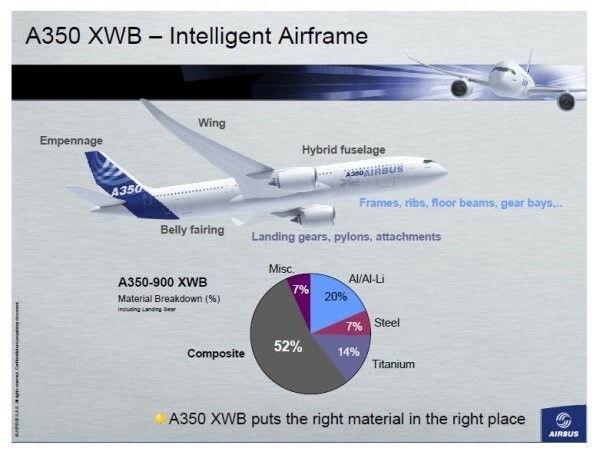 Likewise, Boeing’s hot-seller, the 787 Dreamliner, features around 50% composite materials leading to an average weight saving of about 20%, while Airbus’ counter offer, the A350 XWB, with a fuselage made entirely of carbon-fibre composite, soars to new heights with an overall composite content of 52%. 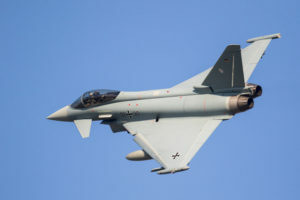 In defence aviation, about 75% of the current European Eurofighter exterior area uses a toughened epoxy skin and, in total, about 40% of its structural weight is made up of carbon-fibre reinforced composite material. Sustainability aspects, like lower fuel emissions, are an important side benefit of structural weight reductions. In fact, CO2 emissions are already targeted by regulatory authorities, and future emissions goals present a challenge for the aerospace industry and global carriers. In this sense, electric airplanes might contribute to curb and ultimately reduce future emission growth. Their development will further increase the demand for lightweight airframe structures to offset the weight of the potentially enormous battery packs. A similar development can already be witnessed in the e-car mobility arena at the moment.